I wrote this post a couple of weeks ago when I was sixteen weeks pregnant, and starting to feel quite large! 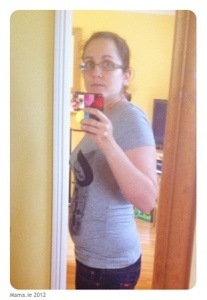 16 weeks. Well that flew by. I had a GP appointment today for a checkup, because it’s been four weeks since my hospital visit. So I went along to the doctor’s appointment and never remembered for a second the urine sample that I was supposed to bring. Thankfully one of the lovely side effects of pregnancy is that I can pee on demand so it wasn’t really a problem. All is good with the baby. We got to hear the heartbeat on the Doppler. And the doctor measured my bump and pronounced me to be huge. Ok, so no, those weren’t his exact words. He said my fundal measurement was the far range of normal. That’s doctor-speak for “your bump is big”! Lisa, you look so cute! Gorgeous pic. Look at your teeny-weeny coochie-coo bump! Certainly doesn’t look huge from here. I dunno. It’s bigger than it was at the same stage last time around. However that being said, it’s two weeks now since I took that picture and it hasn’t changed at all. I’ve another appointment next week and I’m expecting to be told I’m measuring smaller than normal. I definitely think I grow babies who grow in serious spurts. It’s all or nothing with them.